Exercise by dancing and dancing with an emphasis on exercise. With Exercise Dancing it is hoped that you don't just work up a sweat but feel moved by the music and let a little of your joy shine through. Classes are based around getting the big muscles of the legs working. But you will also use hips, arms and shoulders. You can just move your feet - or you can add embellishments with other parts of your body. Exercise Dancing can also give your brain a workout if you decide to add those extra layers! No. If you can walk you can take a class. What sort of dance is it? It is a freestyle fusion dance based on a number of influences including modern jazz and belly dance. It is not a partner dance. Do I need to remember lots of different steps? No. Most of the sequences are very short and they are repeated for most of a track. And you can follow Judith most of the time. 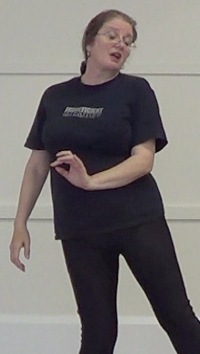 The music is chosen for its strong beat and interest for dancing. It could be pop, rock or even blues - for instance Eurythmics, Stones, Saffire. All classes are taken by Judith. Will dance moves be taught? Yes, there will be some time dedicated to teaching how to get your body to move - but there is no pressure to perfect movement - providing your variation looks safe. More help will be given on request - providing the class as a whole are interested. Judith has been teaching dance to adults for over 17 years and during that time has studied the theory of Safe Dance Practice at QUT and has had over 100 hours of practical training with a sports physio. Classes will be safe as she can make them - but she is not a physio or a doctor. If you have known injuries or problems please clear the class with a registered medical practitioner. How much are the April or May 2019 30-minute classes? Judith is available to take groups for one off or a series of classes at your venue or at the South Brighton studio. An additional charge will be required for other studios (typically $25/hour). How much are the on going classes? Cards are valid for 6 consecutive weeks when bought "two-for-one"
You can wear comfortable clothes to exercise in - or if you prefer something to feel a little bit special. Footwear should enable you to move so high heels are not recommended. Some venues (such as Drake Street) are "No Street Shoes" - so bare feet or indoor shoes for the class. Just turn up at one of the classes listed a few minutes before the start time. Please check no more than a week ahead that your class is still available. Low class numbers may lead to cancellation. If your question is not covered, please feel free to contact us.